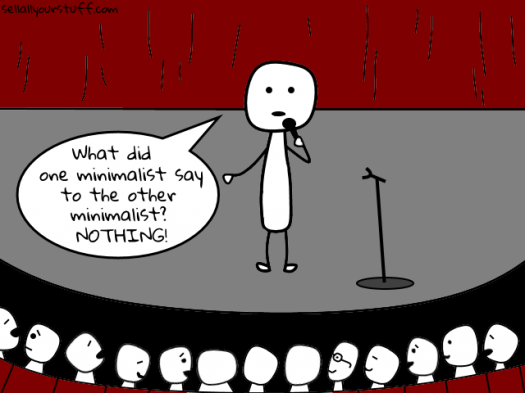 See where on the minimalist spectrum you are! Have you ever re-purposed anything? No, I'd like to but I'm not that creative. No, if I want something I just buy it! YES! OMG! I go curb picking all the time just so I can make something awesome! Yes, but only my own stuff and only when I'm ready to toss it. Pay off your mortgage and invest the rest. Go on a shopping spree...cha-ching!!! Buy a Lamborghini and get the Rolling Stones to play your birthday party. Spend some time and money on experiences. Do your best Wilma Flintstone and Betty Rubble and…CHARGE IT! Get a 2nd job to earn some extra money to go. Look around your house to see if you can sell a few things to cover the cost. Go camping in a remote area. Stay in a high-end hotel suitable for an A-list celebrity and to heck with the cost! Find someone that needs a house sitter and stay for free. Hangout at the food court and eat bad food (and people watch). Go out and buy what they’ve asked for, practical or not. Ask them if there’s anything they NEED rather than WANT. Make them something special with materials you already have. Wait to receive gifts first then re-gift those to family/friends. Stylin’ and profilin’. Nothing but fresh, fine and fancy here! I buy new clothes once in a while and donate what I no longer wear. I’m poppin more tags at the thrift shop than Macklemore! Bell bottoms are still in style, right? Reading? Ain't nobody got time for that! I’m not selling it for anything less than what I paid for it. I’ll take what I can get and if I don’t sell it, I’ll just donate it. Why would I ever get rid of my stuff? I don’t need the money, I’ll just donate it. The week, the month, and I grab whatever seems like a good deal.